In the Western world we live in a society obsessed by sport. At recreational level, this allows an escape from the pressures of modern life, and, at the elite level, sport is now an established part of the entertainment industry, with enormous material rewards for the participants. At all levels, injury is a constant threat, and, of all injuries, those of the knee fulfil the athlete's greatest fear of spending a long time out of action. This is confirmed by a study from Sheffield, which showed the knee to have been the most commonly injured joint and soccer and rugby to have the highest risks.1 It has been said of our national game that it is not so much a sport as a knee disease! There is little work on the pattern of knee injuries in the United Kingdom, although a multicentre study is currently in progress. The work that has been carried out abroad, however, has produced some interesting information. It is not widely appreciated that ligament damage to the knee is more common than any other type of knee injury pathology (fig 1).3 Many medical students, general practitioners, and paramedics may be familiar with the story of a weight bearing, twisting injury producing a meniscal tear; however, there is generally a profound ignorance about the history and signs of the more common (and potentially more devastating) ligament injuries. The “miscellaneous injuries” category takes up a quarter of the total, and this is made up of a selection of pathologies such as contusions of the knee and traumatic bursitis. Projecting from American figures, a casualty department covering a population of 400 000 should expect to see about 500 significant knee injuries a year. Prompt management can quickly return a sportsperson to the playing field. For example, a player with a meniscal tear can have arthroscopic surgery and return to sport at three to four weeks after injury. Furthermore, as most of the sportspeople injured are in the wage earning population, their time away from employment can be minimised. This is cost effective to society as a whole. At present, however, the player presenting with a knee injury tends to get a poor deal. We know that an injury to the ACL is one of the most common ligamentous problems to present (fig 2).3 Despite this, a study looking at 119 consecutive, clinically obvious, anterior cruciate ruptures presenting to a specialist knee clinic found a mean delay from injury to diagnosis of 22 months.6 Most of these patients had been injured playing sport, and the vast majority had attended and been discharged from a hospital casualty department at the time of their injury. Of more concern was the fact that 30% of the patients had been seen by an orthopaedic surgeon, and 28% had undergone an arthrotomy or arthroscopy without the diagnosis having been recognised. Some 90% of these patients had a classical history of an ACL injury with a weight bearing twist, a pop or a snap, and swelling within four hours; then a subsequent history of repeated giving way episodes when trying to change direction off the injured leg. One patient had had no fewer than three arthroscopies before being told his symptoms were “imaginary” despite having a classical history and obvious physical signs. There are a considerable number of patients who, with alteration of lifestyle and an acceptance of symptoms, never have their ACL injury diagnosed at all. Even in those fortunate enough to have had a diagnosis, the outcome may be less than ideal. A recently presented study showed that, of failed ACL reconstructions referred to a tertiary referral centre, the cause of failure in over 80% of cases was technical error.7 These patients were often subjected to lengthy periods of fruitless rehabilitation before failure was finally accepted and the need for revision acknowledged. A further multicentre study still in progress has shown this picture to be similar around the United Kingdom. reconstruction, if necessary, by a surgeon with appropriate training, performing the procedure to a high standard on a regular basis. With an incidence of about 30 cases of ACL injury per 100 000 people per year, any district general hospital should have a sufficient throughput to provide a surgeon with enough patients to maintain and improve his/her operative skills. A hospital with a catchment area of 400 000 population will have about two fresh ACL injuries a week presenting through their casualty department. The corresponding number of other knee injuries can be derived from figs 1 and 2. ACL reconstruction is an operation with a minimal margin for error and is not for the occasional operator. We need to educate the sporting public that it is reasonable to ask surgeons about their experience and results for a particular procedure. Anyone who is a specialist in this field is unlikely to take offence. A surgeon performing less than 20 ACL reconstructions a year is unlikely to maintain and improve his/her skill levels. One would assume appropriate training had been received in the first instance, generally including a specialist training fellowship. For the more complex injuries, a regional pattern of referral is desirable. Some of the serious but less common problems requiring reconstruction present so infrequently, that no single surgeon will see sufficient numbers unless the injuries are directed to a specialist centre. The surgery may be particularly demanding, requiring familiarity with many reconstruction techniques and different types of graft, with the local availability of allograft being very useful. Even patients with complex injuries such as knee dislocation can be offered a good functional result if they have prompt attention and appropriate reconstruction. This may involve repairing or reconstructing all damaged structures at an early stage, often within 10 days of injury before soft tissue oedema creates technical difficulty. In order to raise standards, regional referral should be set up and supported. The British Orthopaedic Association has recently formed a working party to produce guidelines for best practice in the management of ACL injuries. Their report will be controversial but will be a small step in the right direction. Protection of the right to practice occasional ligament reconstruction surgery is unjustified, but only time will tell whether there is the political will to see the recommendations implemented. With appropriate subspecialist management, we may expect a brighter future for the injured sporting knee. Classification of 500 ligament injuries. ACL, anterior cruciate ligament; PCL, posterior cruciate ligament; MCL, medial collateral ligament; LCL, medial collateral ligament. Nicholl JP, Coleman P, Williams BT. Injuries in sport and exercise. Sports Council, 1991. Kujala UM, Taimela S, Antti-poika I, et al. Acute injuries in soccer, ice hockey, volleyball, basketball, judo and karate: an analysis of national registry data. BMJ1995;311:1465–8. Myasaka KC, Daniel D, Stone ML, et al. 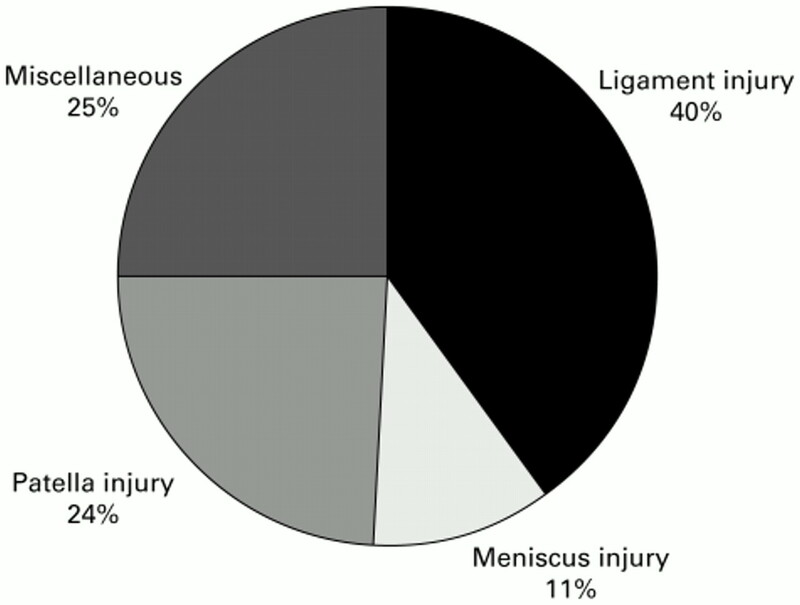 The incidence of knee ligament injuries in the general population. Am J Knee Surg1991;4:3–7. O'Shea KJ, Murphy KP, Heekin D, et al. The Diagnostic accuracy of history, physical examination, and radiographs in the evaluation of traumatic knee disorders. Am J Sports Med1996;24:164–7. Gelb HJ, Glasgow SG, Sapega AA, et al. Magnetic resonance imaging of knee disorders: clinical value and cost effectiveness in a sports medicine practice. Am J Sports Med1996;24:99–103. Bollen SR, Scott BW. 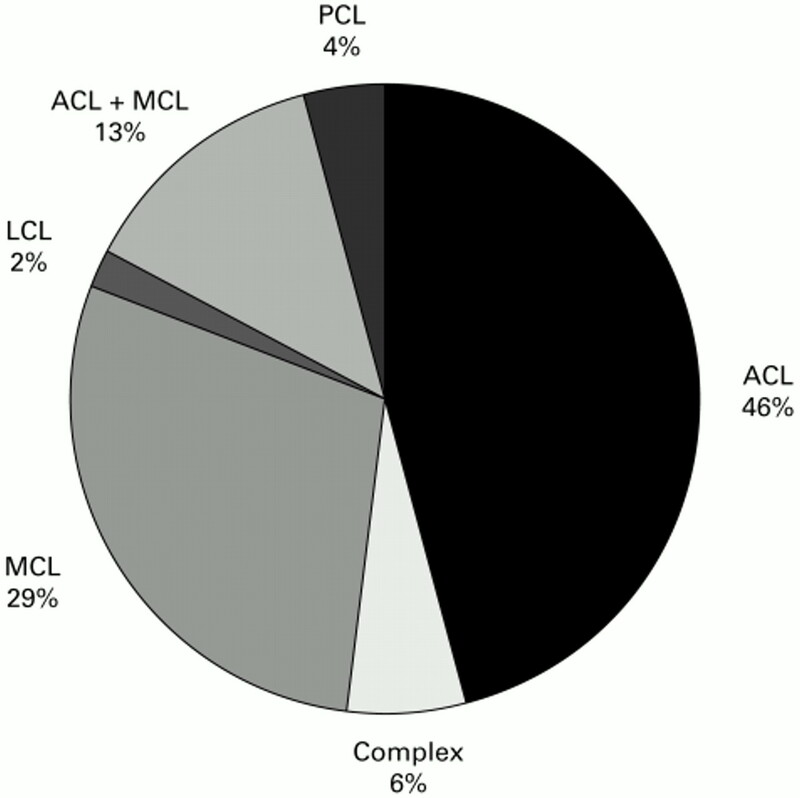 Anterior cruciate ligament rupture: a quiet epidemic? Injury1996;27:407–9. Ng ABY, Bollen SR. Failed anterior cruciate reconstruction: orthopaedic proceedings. J Bone Joint Surg1999;suppl III:278. Bollen SR. Ligament injuries of the knee—limping forward? Br J Sports Med1998;32:82–4.